Asghari, G., Zahabi, F., Eskandarian, A., Yousefi, H., Asghari, M. (2014). Chemical composition and leishmanicidal activity of Pulicaria gnaphalodes essential oil. Research Journal of Pharmacognosy, 1(4), 27-33. G. Asghari; F. Zahabi; A. Eskandarian; H. Yousefi; M. Asghari. "Chemical composition and leishmanicidal activity of Pulicaria gnaphalodes essential oil". 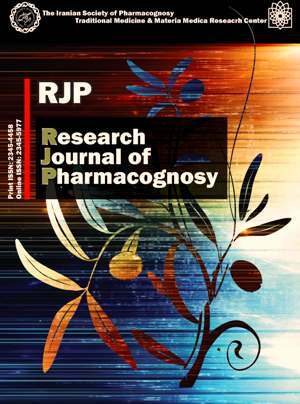 Research Journal of Pharmacognosy, 1, 4, 2014, 27-33. Asghari, G., Zahabi, F., Eskandarian, A., Yousefi, H., Asghari, M. (2014). 'Chemical composition and leishmanicidal activity of Pulicaria gnaphalodes essential oil', Research Journal of Pharmacognosy, 1(4), pp. 27-33. Asghari, G., Zahabi, F., Eskandarian, A., Yousefi, H., Asghari, M. Chemical composition and leishmanicidal activity of Pulicaria gnaphalodes essential oil. Research Journal of Pharmacognosy, 2014; 1(4): 27-33. 1Department of Pharmacognosy, Faculty of Pharmacy, Isfahan University of Medical Sciences, Isfahan, Iran. 2Isfahan Pharmaceutical Sciences Research Center, Isfahan University of Medical Sciences, Isfahan, Iran. 3Department of Parasitology, faculty of Medicine, Isfahan University of Medical Sciences, Isfahan, Iran. 4Department of Biotechnology, College of Agriculture & Natural Resources,University of Tehran, Tehran, Iran. Background and objectives: Several natural compounds have been identified for the treatment ofleishmaniasis. Due to a few safe drugs and the side effects caused by available chemotherapy, some new drugs for treatment of leishmaniasis are requested. The genus Pulicaria (Asteraceae) is represented in the flora of Iran by five species. Phytochemical studies on Pulicaria species have revealed some flavonoids and terpenoids with leishmanicidal activity. In the present investigation chemical composition and leishmanicidal activity of Pulicaria gnaphalodes essential oil have been studied. Methods: The essential oil of the aerial parts of the plant was obtained by Clevenger apparatus and was analyzed by GC/MS. Antileishmanil activity was assessed against promastigoes of Leishmania major. Results:The major components from P. gnaphalodes essential oil have been reported to be geraniol, 1,8-cineole, chrysanthenone, α-pinene, chrystanthenone, α-terpineol and filifolone. The alcohol monoterpenes with contribution of 25.04% constituted the major portion of the essential oil, while hydrocarbon monoterpenes and hydrocarbon sesquiterpenes with contribution of 7.08% and 2.38%, respectively occupied the next rates.In the present experiment the essential oil of P. gnaphalodes progressively inhibited Leishmania major growth in concentrations ranging from 0.125 to 50 µL/mL (parasite culture) in 24 h. The essential oil at 50 µL/mL eliminated the promastigotes at the beginning of treatment. It showed antileishmanial activity in concentration of 1.06 µL/mL and destroyed all parasits in 24 h. Conclusion: Pulicaria gnaphalodes antileishmanial activity, could suggest the species and constituents as possible lead structures for antileishmanial drug discovery. Ali MS, Jahangir M, Saleem M, Ahmad VU. Chemical constituents of Pulicaria gnaphalodes. Nat Prod Sci. 1999: 5(3): 134-137. Mozafarian V. A dictionary of Iranian plant names. Tehran: Farhange Moaser. 1st ed. 1375. Wollenweber A, Rustaiyan A. Pulicaria gnaphalodes (Vent.) Boiss. Biochem Syst Ecol. 1991; 19: 673. Rustaiyan A, Simozar E, Ahmadi A, Grenz M, Bohlmann F. A Hardwickiic acid derivative from Pulicaria gnaphalodes. Phytochemistry. 1981; 20(12): 2772-2773. Weyerstahl P, Wahlburg HC, Marschall H, Rustaiyan A. Terpenes and terpene derivatives, XXXII. New cadinene and bisabolene derivatives from the essential oil of Pulicaria gnaphalodes. Eur J Org Chem. 2006; 1993(10): 1117-1123. Shariatifr N, Kamkar A, Shams Ardekani M, Misaghi A, Jamshidi AH, Jahed Khaniki GH. Quantitative and qualitative study of phenolic compounds and antioxidant activity of plant Pulicaria gnaphalodes. J Gonabad Univ Med Sci. 2012; 18(1): 35-41. Ebadollahi A. Iranian plant essential oils as sources of natural insecticide agents. Int J Biol Chem. 2001; 5(5): 266-290. Salehi Surmaghi MH, Amin GH. Screening of Iranian plants for antimicrobial activity III. Daru.1992; 2: 55-62. Iranshahi M, Arfa P, Ramezani M, Jaafari MR, Sadeghian H, Bassarello C. Sesquiterpene coumarins from Ferula szowitsiana and in vitro antileishmanial activity of 7-prenyloxycoumarins against promastigotes. Phytochemistry. 2007; 68: 554-561. Martin-quintal Z, Rosario Garcia-miss M, Mut-martin M, Matus-Moo A, Torres-Tapia LW, Peraza-Sanchez SR. The leishmanicidal effect of [3S]-16,17-Didehydrofalcarinol, an oxylipin isolated from tridax procumbens, is independt of NO production. Phytother Res. 2009; 24: 1004-1008. Billo M, Fournet A, Cabalion P, Waikedre J, Bories C, Loiseau P, Prina E, Rojas de Arias A .Screening of new caledonian and vanuatu medicinal plants for antiprotozoal activity. J Ethnopharmacol. 2005; 96: 569-575. Zahabi F, Asghari GR, Eskandarian A, Yousefi H. Leishmanicidal activity of Pulicaria gnaphalodes. Res Pharm Sci. 2012; 7(5). Adams RP. Identification of Essential oils by Ion Trop Mass Spectroscopy. California: Academic Press, 1989. Davies NW. Gas chromatographic retention indices of monoterpens and sesqueterpens on methyl silicon, and Carbowax 20m phases. J Chromatogr. 1990; 503: 1-24. Sadeghi-Nejad B, Saji J, Khademvatan S, Nanaei S. In vitro antileishmanial activity of the medicinal plant Satureja khuzestanica Jamzad. J Med Plants Res. 2011; 5(24): 5912-5915. Mayence A, Vanden Eynde JJ, LeCour L, Walker LA, Tekwani BL, Huang TL. Piperazine-linked bisbenzamidines: a novel class of antileishmanial agents. Eur J Med Chem. 2004; 39(6): 547-553. Celine V, Adriana P, Eric D, Joaquina AL, Yannick E, Augusto LF. Medicinal plants from the Yanesha [Peru]: evaluation of the leishmanicidal and antimalarial activity of selected extracts. J Ethnopharmacol. 2009; 123: 413-422. Weyerstahl P, Marschall H, Wahlburg HC, Christiansen C, Rustaiyan A, Mirdjalili F. Constituents of the essential oil of Pulicaria gnaphalodes (Vent) Boiss. from Iran. Flavour Frag J. 1999: 14: 121-131. Shaig Ali M, Jahangir M, Uzair SS, Wahba Erian A, Bakhsh Tareen R. Gnapholide: A new guaiac-dimer from Pulicaria gnaphalodes (Asteraceae). Nat Prod Lett. 2002; 16(3): 179-186.
 khani A, Asghari J. Insecticide activity of essential oils of Mentha longifolia, Pulicaria gnaphalodes and Achillea wilhelmsii against two stored product pests, the flour beetle, Tribolium castaneum, and the cowpea weevil, Callosobruchus maculates. J Insect Sci. 2011; 12(73): 1-10. Machado M, Dinis AM, Santos-Rosa A, Alves V, Salgueiro L, Cavaleiro C. New anti-leishmania agents: the potential underlining Thymus sp. volatile extract against L. infantum, L. major and L. tropica major compounds may not be the answer. 22nd European Congress of Clinical Microbiology and Infection Disease. 2012 31 mar-2 Apr; London, UK. Ueda Nakamura T, Mendonca Filho RR, Morgado Diaz JA, Korehisa Maza P, Dias Filho BP, Garcia Cortez DA. Antileishmanial activity of Eugenol-rich essential oil from Ocimum gratissimum. Parasitol Int. 2006; 55: 99-105. Mikus J, Harkenthal M, Steverding D, Jurgen R. Invitro Effect of Essential oils and isolated mono- and sesquiterpenes on Leishmania major and Trypanosoma brucei. Planta Med. 2000; 66(4): 366-368. Anthony JP, Fyfe L, Smith H. Plant active components- a resourse for antiparasitic agents. Trends Parasitol. 2005: 21(10): 462-468. Napolitano HB, Silva M, Ellena J, Rodrigues BDG, Almeida ALC, Vieira PC. Aurapten, a coumarin with growth inhibition against Leishmania major promastigotes. Braz J Med Biol Res. 2004; 37: 1847-1852.